There's still enough time this summer to do a little DIY and build an outdoor shower in your yard. Besides the fact that it could be a life-changing addition, it's actually easier to set up than you may think. Outdoor showers may seem like a luxury—something that only those with beach houses would need or be lucky enough to have. But if you have kids and pets that love to play in the yard, or if you’re an avid gardener, runner, or someone that enjoys the freedom of bathing in nature, you may want to consider an outdoor shower for your own home. Lucky for you, an outdoor shower can be an accessible feature for just about anyone. It all depends on how simple or complex you want your shower to be. A simple outdoor shower with cold water costs approximately $1,000 or less. An outdoor shower with an enclosure and hot and cold water will run about $4,000–$8,000. Join Zillow as they walk us through four things to consider before taking the plunge on your own little piece of outdoor bathing heaven. 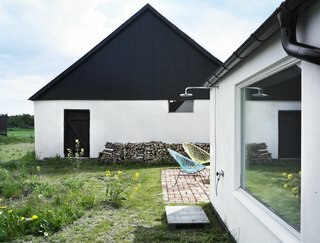 The home’s exterior fittings, like the outdoor shower, offer modern comforts. This is one of the most important considerations. It’s best to choose a spot that you use often. In most cases, anywhere near the back entrance to your home is a good choice—maybe adjacent to the back door or on the back deck. If you have a pool, situate the shower nearby for easy rinse-offs before and after swimming. Last but not least, go for a sunny spot. This will help keep mold and mildew at bay, and provide natural warmth while you rinse. 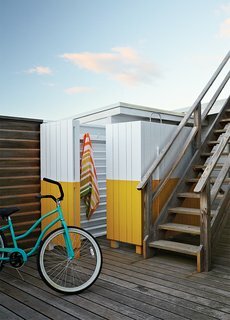 After a day at the beach, an outdoor shower tucked toward the back of the house allows everyone to rinse off without tracking sand indoors. 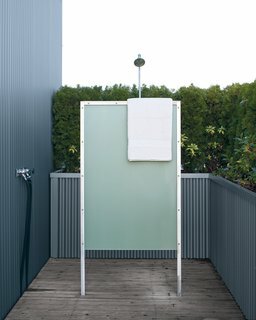 Privacy is a fairly important consideration, unless you think only swimsuit-clad people will use the outdoor shower. 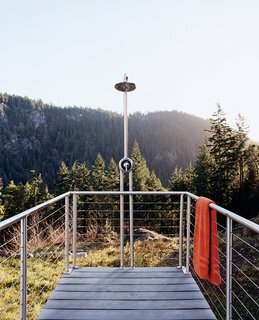 "I encourage people to build with the most modest person in mind," says Ethan Fierro, author of The Outdoor Shower. The trick is, you want the shower to feel private and far from prying eyes, but you also want to keep the natural feeling. 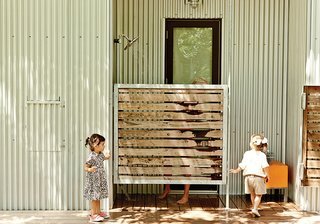 An outdoor shower was the family’s first construction project. "Doing the shower made us realize we can build things the way we want to build them," says Meg. 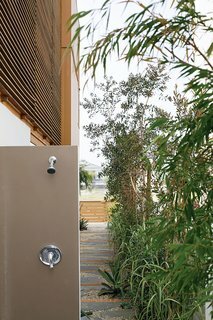 An outdoor shower in the lower courtyard includes most of the materials that define the project, including Cor-Ten steel posts, horizontal ipe slats and decking, a custom seat and towel shelf set into a natural boulder, and concrete pavers. 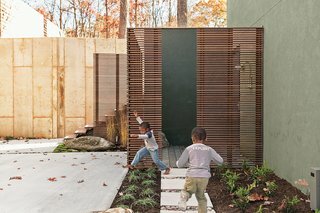 The yard includes many elements built for play, like a water feature embedded in a concrete wall that is fed by runoff rainwater collected from the breezeway roof. Another option is building corrugated metal wing walls to create a shower "corner" of sorts, where swimmers can rinse off after a dip. You can make this more private by adding a third wall to the design. Of course, there’s always the more elaborate option, which would be to surround the shower with wooden walls. 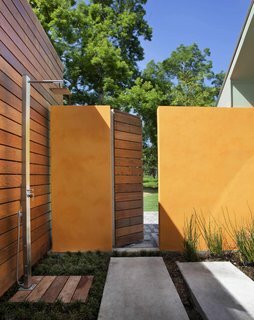 The wood screen concealing this outdoor shower was painted yellow and white, matching the color scheme in the home's guest bathroom. The simplest and most inexpensive plumbing option, and one that many people choose, is a shower connected to a garden hose, which is then hooked up to an outside faucet. This cold-water fixture is perfect for an outdoor shower that’s used only in the heat of summer, and mostly for cleaning off dirt and sand. Mimicking the cantilever of the house, an outdoor shower just off the master bedroom stretches out gently toward the surrounding woods. The most elaborate—and most expensive—is the plumbed-in outdoor shower. This is worth investing in if you anticipate consistent outdoor showers, and not just for cleaning up after a hot day in the sun. The only downside to this option: if you live in an area with freezing winters, you have to make sure you can fully drain and insulate the plumbing so it doesn’t burst. The simplest and most common drainage system is letting the used water drain into your yard. If you don’t have very porous ground in your yard, or if the outdoor shower is close to your home, consider attaching the plumbing to your home’s drainage pipes or installing a French drain (essentially, a gravel-lined channel connected to a pipe that directs water to a drainage area). The shower offers a multisensory experience: the architect described how clients can take hot showers in the rain or simply lounge in the capacious garden area. Mint plants growing between the pavers release a pleasant smell when stepped upon. Add some affordable accessories that greatly increase the fun and pleasure of showering outdoors. A large rainfall showerhead enhances that outdoor feeling, and plants or flowers in the shower area or peeping through the enclosure add a whimsical touch. 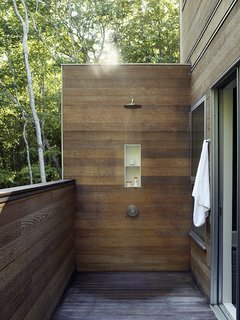 A wood-lined outdoor shower adds a modern touch to one of the decks. The outdoor shower situated off of the master bedroom is enclosed to offer privacy and features a courtyard garden. Michael Arp of Lanoha Nurseries designed the house's landscaping. With just a little planning and effort, you can install your own outdoor shower and stay cool during the rest of the warm summer months. 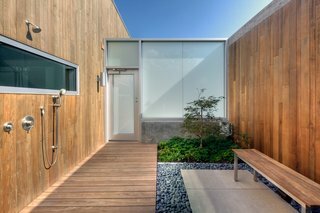 An outdoor shower tucked behind a screen off the master bedroom neutralizes this threat. "We thought it sounded great for muddy kids to run up and shower off there," Coco says.